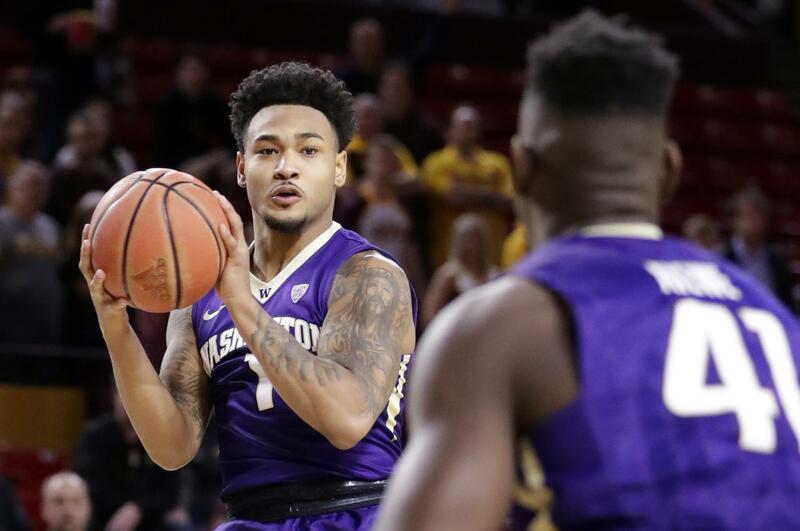 SEATTLE – Freshman Jaylen Nowell scored 25 of his 32 points in the second half and Washington rallied from nine points down in the final five minutes to beat Belmont 86-82 on Friday night in Mike Hopkins debut as the Huskies head coach. Nowell was fantastic down the stretch as Washington (1-0) got off to a positive start after closing last season on a 13-game losing streak. Nowell scored nine points in the final two minute, 24 seconds, including a driving layup with 32 seconds left to give Washington an 80-79 lead. Austin Luke missed a 3-point attempt for Belmont on its next possession and David Crisp knocked down a pair of free throws with 22 seconds left for an 82-79 lead. Kevin McClain scored on a backdoor layup with 14 seconds left to pull the Bruins within one, but Nowell made two free throws. Washington fouled Luke, who made the first and purposely missed the second. Matisse Thybulle got the rebound and made two free throws to clinch the victory. Crisp added 16 points and Carlos Johnson had 10 points off the bench, most of them coming late after Washington trailed 70-61 with 5:40 remaining. Nick Hopkins led Belmont (0-1) with 22 points in his college debut, including six 3-pointers. Dylan Windler added 18 points before fouling out late. The Bruins made 10 3-pointers but were just 4 of 14 behind the line in the second half. The Bruins made life difficult for the Huskies in their first game under Hopkins, who left his role as the presumptive replacement for Jim Boeheim at Syracuse to rebuild the Washington program after Lorenzo Romar was fired last March. Hopkins has acknowledged it will be a rebuild for the Huskies, but there glimpses of optimism beginning with Nowell. The Seattle native was the one member of Washington’s touted recruiting class to stick around after Romar was fired. He made 12 of 18 shots and added five rebounds. Belmont was an NIT team a season ago and its style of hoisting 3-pointers was a difficult matchup with the Huskies still learning how to play Hopkins’ zone defense he brought from Syracuse. Belmont attempted 31 3-pointers out of 65 field-goal attempts. Published: Nov. 10, 2017, 10:01 p.m.